Bruno Ferrandis opened his final year with the Santa Rosa Symphony this past weekend in an ambitious program. 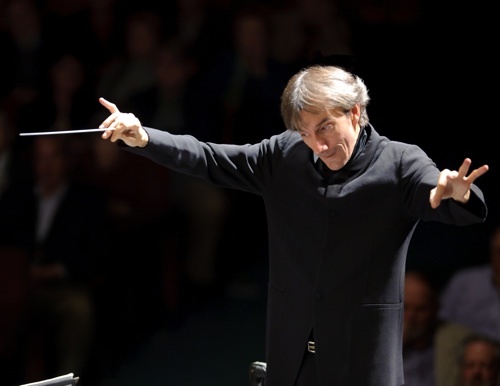 The last ten years under his baton have been exhilarating, and his flamboyant conducting will be missed. But a search for his replacement as Artistic Director has already begun, and next year should be a lot of fun as five different conductors do their best to wow the savvy North Bay audience. Monday evening’s program, Oct 10, in Weill Hall at Sonoma State featured the talents of his brother, flutist Jean Ferrandis, and he was extraordinary. But before his brother’s entrance, Bruno stretched the orchestra in an intensely atmospheric tone poem, Benjamin Britten’s Four Sea Interludes. This was music that Britten had put together out of his opera, Peter Grimes, and the music was as yearning and contradictory as the opera is grimly compelling. In concert with the flute theme of the evening, Interludes begins with long-held flute notes in unison with high violins, a single sound as plaintive as a sea gull on a cold British coast. These were answered by the lowing of horns and bass trombone. This felt like Nature in all Her Awful Grandeur, the high thin winds, the clarinet-quick scrabble of sand crabs, the rhythmic billowing of breakers, the stillness of the sea. There were inexplicable points of brightness with sharp wood blocks and marimba, and a call-and-response of clarinet and horns, transforming that early morning feeling into the hurly-burly of midday. And then Ferrandis gathered his forces for a storm, with low timpani sounding as hushed and dramatic, and a chromatic step by step climb of big brass. Afterwards, soft cymbal and harp notes divided the silence like stars after the storm. The conducting was exacting, almost joyful in its tension. The two Ferrandis brothers came out to sustained applause, and then swept into an unusual work, Leonard Bernstein’s Halil: Nocturne for Flute and Small Orchestra. This was late Bernstein, an experiment in tone rows that still had room for lyricism and touches of jazz. Halil is the Hebrew word for a shepherd’s pipe, and as modern as the work was, there remains the lively feeling of that ancient instrument. And Bernstein did not let it stand on its own, but shadowed it with the warmth of low alto flute, and high piccolo echoed its phrases, played respectively by Kathleen Lane Reynolds and Stacey Pelinka. Those two had already distinguished themselves in the Britten. Jean was warm, bright and unforced, linking Bernstein’s curious intervals into miles of scenic road, while the orchestra exercised lovely color and restraint. In many of his moments he was accompanied by percussion, with one lovely cadenza arrayed against soft kettle drum. He returned after intermission in Mozart’s Concerto No. 1 in G Major for Flute and Orchestra, and the two works could not have been more different. Mozart seems to understand the flute better than Bernstein, and here Jean was able to display its rich bottom and pure upper ranges, with the whole full of eye-popping cadenzas… and lyricism! Magical! After the first movement the audience erupted into spontaneous applause (as they would have in Mozart’s day, instead of holding their applause to the end). The Adagio felt more like Handel, with limpid strings and expressive horns – and those horns were tight throughout, led by Meredith Brown and Alex Camphouse, regulars of the Berkeley and Oakland Symphonies. Jean finished with a flute cadenza full of poise and snap. It was an astonishing moment, lyrical and liquid, with notes falling like curtains of raindrops, and the whole improvised on the spot with the ‘theme’ popping out unexpectedly. The audience stood back up and applauded long. The younger Ferrandis retook the stage to lead Beethoven’s good-natured Symphony No. 8 in F Major, which I recently heard in the East Bay. This orchestra’s professional core was exceptionally tight, and better than most orchestras. But it was the end of a long evening and the energy was beginning to run out. If this were first on the program, they would have been selling the CD’s. The Santa Rosa Symphony is a quick 50 minutes from the East Bay, and worth the drive. This was the first of seven programs in a packed season. Next up is “Keyboard Brilliance,” on Nov 5, 6 and 7, with Liszt’s Les Préludes and Bartók’s Concerto No. 2 for Piano and Orchestra, both featuring young star pianist Orion Weiss, and followed by Schumann’s Symphony No. 2. See srsymphony.org for more information and tickets. Photo, top, of Bruno Ferrandis; photo by Susan and Neil Silverman. 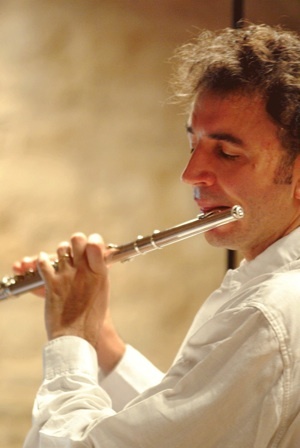 Below, flutist Jean Ferrandis, photo courtesy of the artist.